You always know where you are with a Jodi Picoult novel, reading about some terrible dilemma or other and trying to guess the twist. They are almost comfort reading. I did guess the twist in Leaving Time about half way through, and texted my guess to Honey-Bunny, who had already read this book. She very wisely didn’t respond, leaving me to enjoy the rest of the story without being completely sure of myself or the author. Leaving Time follows the story of Jenna Metcalf, who has been searching for her mother, Alice, for over ten years. Alice was a scientist who studied grieving elephants. She disappeared after a terrible accident (or possible murder?) at the family’s elephant sanctuary, when an employee was trampled by one of the elephants. Jenna’s father has been in a mental asylum since the accident, which happened when Jenna was a toddler. Jenna lives with her grandmother, who refuses to talk about Alice with Jenna. Eventually Jenna starts to actively search for her mother, using the services of Serenity Jones, a once celebrated psychic who had her own television show, and Virgil Stanhope, a former police officer. Virgil originally investigated the accident at the elephant sanctuary. The novel is told by all of the characters in turn, Jenna, Serenity, Virgil, and Alice. Alice’s chapters tell the history of Jenna’s search, from when she first met Jenna’s father in Africa and fell pregnant, to when she came to live at his elephant sanctuary in New England. Alice’s story is mixed in with the findings from her research and examples of elephant’s behaviours, which are more interesting than I would have expected before I read this book. I’ve read quite a few Jodi Picoult books and enjoy them, despite some of the issues she raises having no happy solution or answer at all, but Leaving Time is a gentler read. It doesn’t even bother me that I sometimes think I am reading the same book over and over, just with a different set of characters and issues to resolve, as I said earlier, sometimes it is comforting to know where you are with an author. In Leaving Time, there are no nasty dilemmas to ponder over, except for the plight of elephants in captivity. I will never see an elephant in a zoo or away from its natural environment again without feeling terribly sad for the elephant. 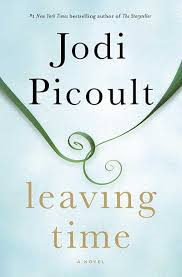 I don’t think Leaving Time is one of Jodi Picoult’s best books, but readers who enjoy her work will enjoy Leaving Time.